First, let me say that when you are making homemade gin, you are most likely making a compound gin not a distilled gin. You can read more about the difference between the two here at Serious Eats. I like to be honest and call mine "gin flavored vodka" because that's exactly what it is. In point of fact, all gin is basically flavored vodka, but you can read more about that from Jeffrey Morgenthaler. Second, let me say that this whole experiment started with some left over rosemary infused vodka made for my Rosemary Lemon Drop Martini. 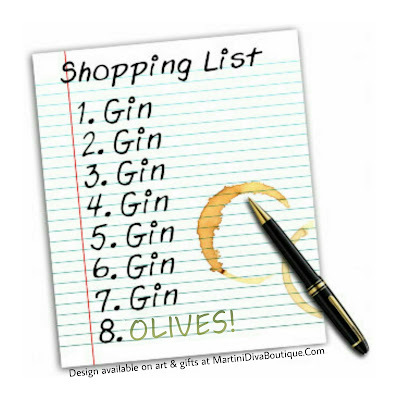 After I had made my martini I had a considerable amount of the rosemary infused vodka leftover and, when I went to put it in the refrigerator, my eyes fell on some of the spices I keep in magnetic metal tins on the fridge door. One of these was filled with juniper berries, another with cardamom, both of which are often aromatics used in flavouring gins. It wasn't much of a leap from there to the idea of homemade gin, though, truthfully, I was just thinking of adding some more flavors to the rosemary infused vodka for another cocktail recipe. At some point while adding the juniper berries, cardamom, some lemon peel and orange peel, I realized I had the makings of a gin flavored vodka. 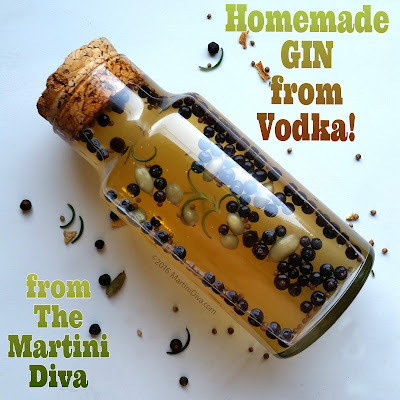 DIRECTIONS: Add the vodka and juniper berries together in a sealable infusion bottle. Allow this to infuse for a full week. Next day add the coriander, lemon peel and lavender and give this another day to infuse. The next day add the cardamom and rosemary and let this get happy for 12 hours. Strain out the flavoring ingredients and bottle up. If you want a clearer gin, run it through a Brita water filter a few times. Note: I do not crush my pods as I want a more subtle infusion from these ingredients. Any seeds or pods that you want more flavor from, feel free to hit them up with a little mortar and pestle action. Your homemade gin should last for up to a year, but I seriously doubt if you will have it around that long. The thing about making your own gin is you can try different flavoring elements, as well as using different infusion times for those elements to subtly adjust the flavor of your homemade gin. Different types of gin work with different types of cocktails, so I hope to try using some other floral elements, like chamomile, or maybe even some cucumber peels and maybe dried orange peel instead of lemon and adjusting the amount of the spices. I might also add an herb or two like basil or cilantro.